We all know mornings can be a little hectic. 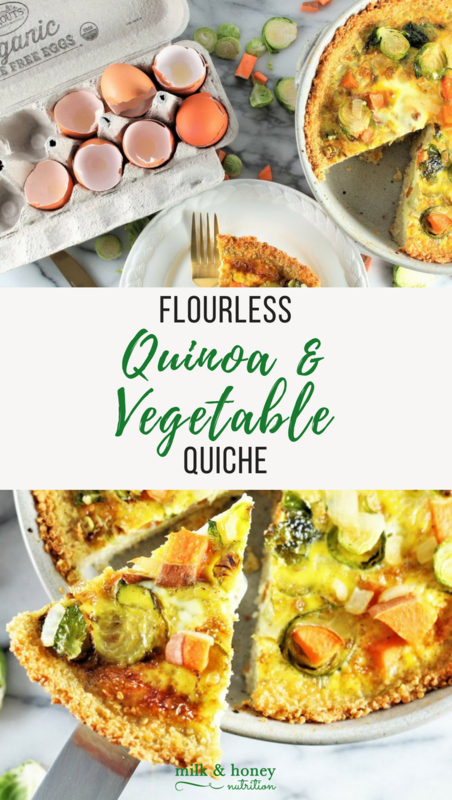 This Flourless Quinoa and Vegetable Quiche is super simple to make, and makes weekday breakfasts a breeze. Prep it on the weekend and you've got a healthy, delicious, gourmet breakfast ready to go for the week! It's the perfect combination of fat, protein, and complex carbihydrate to get you ready to conquer your day. This recipe was sponsored by Sprouts Farmer's Market. All ideas and thoughts are my own. Cook the quinoa according to package instructions. Set it aside to cool. Once the quinoa has cooled, add the egg whites and cheese to the pot and stir to combine. Carefully press the quinoa mixture into a greased pie plate. Bake for 15 minutes. While the crust is baking, sautee the vegetables (onions, sweet potatoes, and brussel sprouts) in avocado oil over medium heat for 10-15 minutes. Set the vegetables and crust aside to cool. Combine with eggs, milk, and seasonings in a bowl and whisk to combine. Add the sauteed vegetables to the pie plate and spread into an even layer. Pour the egg mixture over the vegetables. Return the quiche to the oven and bake for 35-40 minutes or until the eggs have set in the middle. Enjoy!